Comments: A century before the Clone Wars, this 2,000 year old bounty hunter went into hibernation to recuperate after being tortured by Mandalorians. Awakening shortly after the Battle of Geonosis, Durge learns that the only Mandalorians still alive are the Clone Troopers, which were created from Mandalorian Jango Fett. Durge joins the Confederacy to enact his revenge upon Jango Fett's clones. 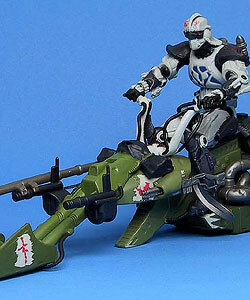 His swoop bike is a high-performance craft with exceptional speed and challenges even the most skilled pilots. Simple vehicles, they achieve their performance through a combination of repulsorlift and turbothrust engines.